They lurk in the darkest shadows. They haunt your darkest nightmares. They appear slow witted at first, but appearances are always deceiving. They are the terror that haunts the night. They are the bastards that hunt in the shadowy streets. They are the Nightmare on Elm Street, they are your worst urban fears made reality. They have been there for as long as your city remembers, yet you never paid them heed until now...the day they approached your doorstep. They are the Nosferatu, Lords of the Night. 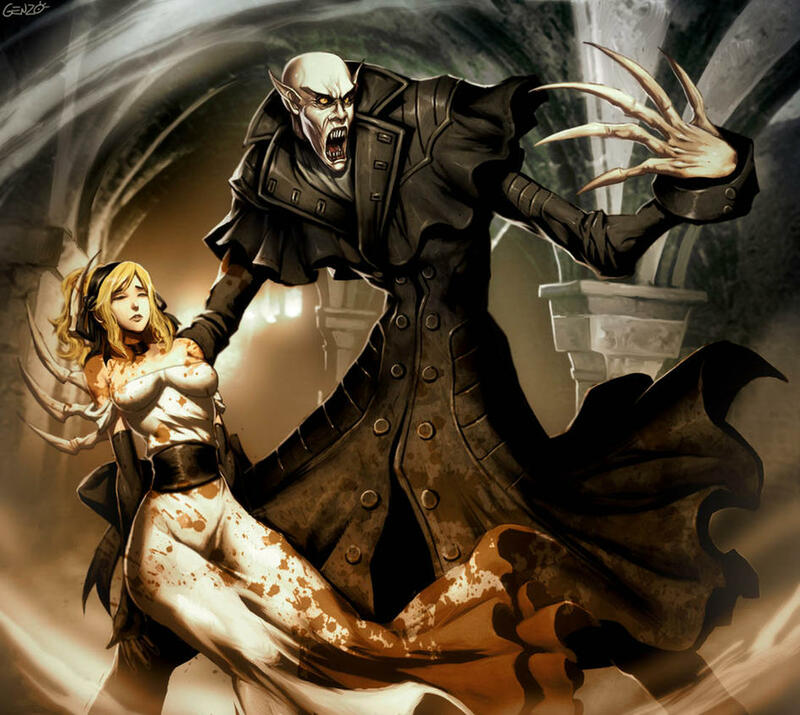 The Nosferatu are believed to be the first true concept of vampires. No, they are not the mortal undead, who masquerade as living creatures only to feast upon their blood or serve their vitae in exchange for fellowship. These are the classic nightmares from hell; the walking dead, whose bodies are all skin and bone and their skin is rotted and gray, with muscle hanging from the bone and their hair tangled like cobwebs. Their eyes are sunken into their sockets, and their teeth are long and sharp. They walk like a beast upon all fours, attacking in the dark with sudden, impossible speed. They are among Mammon's most recent creations (recent in comparison to the rest of her dark history), and act as her vanguard units; attacking with fierce loyalty without warning before vanishing again, leaving nothing but bloodless corpses and nightmares to the few survivors. The Nosferatu have always been fiercely loyal to the great Mammon since their creation, and consider themselves to be her favorite followers (though this isn't exactly true; rather it is a belief they themselves consider true. Mammon may or may not even consider them to be her favorite). Every attack they make upon mortals is done with almost religious zeal, and every attack is the same; strike a mortal or two, drain their blood, return home. Many a Nosferatu returns to the dark palaces of the Regal Necropolis with bellies full of blood, giving them a bloated; almost pregnant; appearance. Though they soon swiftly regurgitate this blood into great vats beneath their aristocratic homes, so that it may be fermented into fine wine. For though the Nosferatu are ugly monsters, their aristocratic history has not been forgotten, and they celebrate their victory for the great Mammon with great feasts, gorging themselves upon fresh blood-wine and splattering the rest upon the walls like fresh paint. - It is unknown why, but Nosferatu have a weird dislike for Garlic. It doesn't harm them or anything; they just... don't like it.